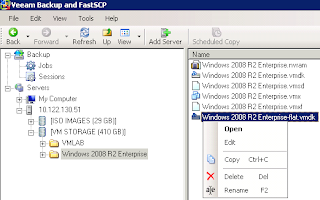 RW 73400320 VMFS "Windows 2008 R2 Enterprise-flat.vmdk"
Note: Veeam FastSCP 3.0 is not officially supported on 64-bit systems, and if trying the above with Veeam FastSCP 3.0 on a 64-bit system, the following error will be thrown "Retrieving the COM class factory for component with CLSID ... failed due to the following error: 800700c1." 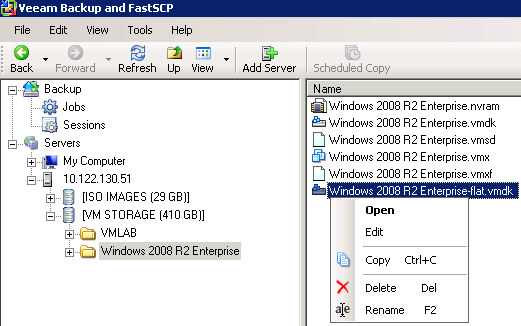 Solution is to either use Veeam Backup or install Veeam FastSCP on a 32-bit system. *Update: many thanks to gb for the following comment - "Under vSphere 5 migrating to a new datastore no longer renames the vmdk or any other files for that matter. However, It does rename the target directory." This may be one of my most pointless posts ever, seeing as it is relatively straightforward to rename a vmdk from command line. Posting along the lines of it always being useful to be aware of different ways to do certain tasks. Just to let you know: Under vSphere 5 migrating to a new datastore no longer renames the vmdk or any other files for that matter. However, It does rename the target directory. gb, thank you for the comment - I will update my post. Cheers!